Effective 1-1-2013 new federal and state payroll withholding regulations apply. Small business payroll software from PayrollMate.com has been updated to help employers comply with the latest rules and process payroll smoothly in 2013. Chicago, IL - Real Business Solutions, Inc., payroll tax software provider, is helping small business owners nationwide comply with government 2013 regulations for income tax withholding. The IRS and the following departments of revenue have updates income tax withholding rules: California, Colorado, Connecticut, District of Columbia, Georgia, Hawaii, Kansas, Kentucky, Maine, Maryland, Michigan, Minnesota, Missouri, Nebraska, New Mexico, New York, North Dakota, Oklahoma, Oregon and Rhode island. Free small business payroll software trial available at http://www.PayrollMate.com/ . "Large U.S businesses can afford to have full time payroll management staff dedicated to paying employees, issuing payroll checks as well as keeping up to date with the ever-changing payroll tax regulations. This is almost never the case for small business owners. This is why we built Payroll Mate, state-of-the-art payroll management software that is easy to use, affordable and always up to date." says Payroll Mate product manager Nancy Walters. By using Payroll Mate, small business owners can save valuable time, reduce cost, increase efficiency, reduce headaches, improve filing and payment accuracy, tighten records security and avoid harsh payroll penalties. 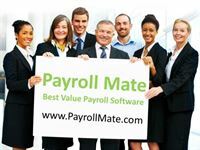 Payroll Mate provides a wealth of features including the ability to automatically calculate net pay, federal withholding tax, social security tax, Medicare, state and local payroll taxes. Payroll Mate also supports different types of payroll pay periods, prints checks, prepares payroll forms 941, 940, 944, W-2, W-3, California DE-9 , California DE-9C, Texas C-3 , Texas C-4, New York NYS-45, Illinois 941 and Illinois UI-3/40. The system allows unlimited tax categories, pre and post-tax deductions and unlimited pay rates per employee making it very flexible and powerful. Automatically calculates federal and state payroll tax withholding. Supports different types of pay periods including weekly, biweekly, semimonthly and monthly. Supports customizable income, tax and deductions categories. Exports Payroll checks to Quicken and accounting software like Microsoft Office accounting. Can be used as QuickBooks payroll alternative with the ability to export payroll data to QuickBooks software. Supports payroll vacation accrual and sick pay accrual. Supports the following payroll forms: 941, 940, 944, W-2, W-3, California DE-9, California DE-9C, Texas C-3 , Texas C-4, New York NYS-45, Illinois 941 and Illinois UI-3/40. Prints IRS 1099 and 1096 forms. Supports income per mile and per piece. Exports payroll reports to Excel, CSV and PDF. Prints on Laser and Inkjet checks. Prints on preprinted scannable W2 forms and W3 forms. Generates comprehensive reports including payroll journal, tax liability and deposit requirement. Prints MICR checks on blank check stock. Give the payroll software from PayrollMate.com a test drive and see for yourself how easy managing payroll can be. Visit payroll software page.